This New Year's, the ride's on Corby: Corby Distilleries marks Responsib'ALL Day 2013 by announcing historic partnership with Toronto Transit Commission. TORONTO, June 5, 2013 /CNW/ - Corby Distilleries Limited and its employees across Canada celebrated the third annual Responsib'ALL Day by joining with the 18,000 employees of Pernod Ricard S.A. and its affiliates around the world in a global day of action devoted to encouraging responsible consumption. This included an all-day event focused on reducing drinking and driving, held at one of Toronto's most environmentally friendly venues, the Evergreen Brick Works. The highlight of the day was the announcement of a ground-breaking partnership with the Toronto Transit Commission (TTC). This New Year's Eve, starting at 7:00 p.m., and continuing through to 7:00 a.m. on New Year's Day, 2014, Corby will pick up the fare for everyone travelling on the TTC, North America's third largest transit system. "This innovative, three-year agreement is a true Canadian first that will raise the profile of this issue in the national discussion," said Patrick O'Driscoll, President and CEO of Corby. "We're proud to partner with the TTC and to show that Corby is ready to take action when it comes to reducing drinking and driving. We know that this is a year-round issue, and the biggest party of the year, New Year's Eve, provides the ideal platform for building awareness about the risks of drinking and driving. It is an invaluable opportunity to remind people about all the safe, responsible transportation options that are available to them - including public transit. In support of these efforts, Corby and the TTC are delighted to say, 'This New Year's, the ride's on us.'" "I am proud of the public service TTC provides. Our team works hard but even more so overnight at New Year's, helping keep Toronto safe," observed Karen Stintz, Chair of the TTC. "Through their sponsorship of TTC's free New Year's service, Corby is highlighting both what TTC provides and the need to act responsibly by not drinking and driving. On behalf of my Council colleagues and fellow Commissioners I thank Corby for their contribution." The announcement is in keeping with Pernod Ricard's agreement made at the 2012 International Center for Alcohol Policies (ICAP) Conference. Pernod Ricard joined with 11 leading beer, wine and spirits companies and two industry trade associations, in agreeing to a five-year program, starting in 2013, built around five commitments and dedicated to reducing alcohol-related harm. In addition to the partnership announcement, Corby's Responsib'ALL Day featured an address from Pierre Pringuet, CEO of Pernod Ricard, outlining the company's global efforts to reduce the harmful use of alcohol, as well as guest speakers such as Anne Leonard in Toronto, Executive Director of "arrive alive DRIVE SOBER®", which works with key stakeholders and community partners on initiatives to eradicate impaired driving in the Province of Ontario, and, at the Montréal event, Hubert Sacy, the Director General of Éduc'alcool, a not-for-profit organization focused on helping young people and adults make responsible decisions about drinking and the circumstances in which they drink. 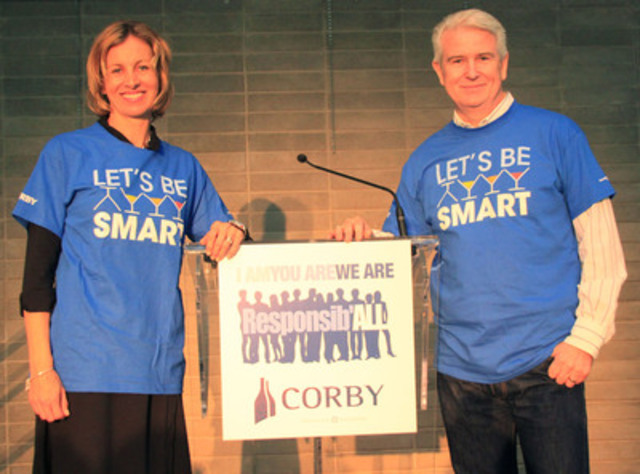 Jan Westcott, President and CEO of Spirits Canada, also joined Corby's Responsib'ALL Day event in Toronto. The day concluded with educational activities designed to give Corby employees tools they can use, in their communities and with their friends and families, to encourage responsible consumption. This included a presentation by Lisa Thompson, from Ontario's Ministry of Transportation, who introduced the "intoxiclock®", an interactive teaching tool that tracks and shows levels of intoxication and the rate at which a body metabolizes alcohol. Responsib'ALL Day is a "convivial" event with a serious purpose. It reflects the global commitment, shared by everyone at Corby and their colleagues throughout Pernod Ricard and its affiliates, to promote responsible consumption. Corby is a leading Canadian marketer and distributor of spirits and imported wines. Corby's portfolio of owned-brands includes some of the most renowned brands in Canada, including Wiser's® Canadian whiskies, Lamb's® rum, Polar Ice® vodka and McGuinness® liqueurs. Through its affiliation with Pernod Ricard S.A., a global leader in the spirits and wine industry, Corby also represents leading international brands such as ABSOLUT® vodka, Chivas Regal®, The Glenlivet® and Ballantine's® Scotch whiskies, Jameson® Irish whiskey, Beefeater® gin, Malibu® rum, Kahlúa® liqueur, Mumm® champagne, and Jacob's Creek®, Wyndham Estate®, Stoneleigh®, Campo Viejo® and Graffigna® wines. Corby was named one of the 50 Best Workplaces in Canada by The Great Place to Work® Institute Canada in both 2012 and 2013. The existing Voting Class A Common Shares and Non-voting Class B Common Shares of the Company are traded on the Toronto Stock Exchange under the symbols CDL.A and CDL.B, respectively. For further information, please visit our website: www.corby.ca.